What’s happening to Etosha’s rhinos? 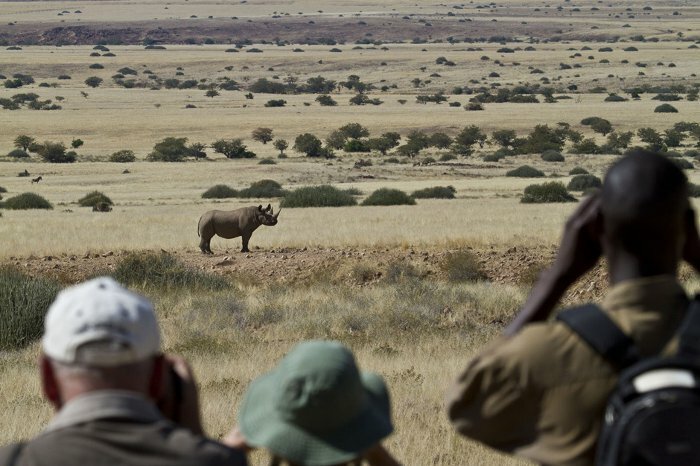 Namibia- Between 2009 and 2011 only one rhino was poached each year. 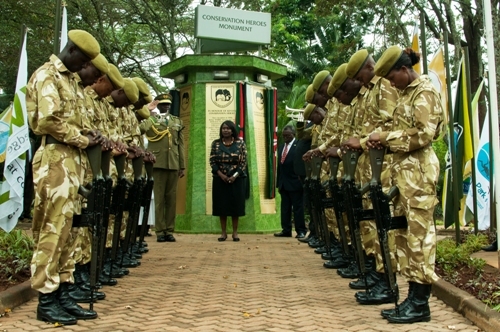 The country had been seen as a model for anti-poaching effectiveness. Much of this has been due to the pro-active attitude of government and their cooperative efforts with communities and conservation groups, such as the Save the Rhinos Trust. Save the Rhino Trust conducting rhino sitings with tourists. In the previous ten years (from 2005 to 2014) 8 white rhinos and 95 black rhinos were poached in total. Then in 2014, a total of 24 rhinos were poached. In response to the loss, in June of last year the Minister of Environment and Tourism, Pohamba Shifeta, announced that the government takes poaching in a very serious light. “Our rangers are not properly trained and they are not dedicated. Thus there is a need to intensify patrols and we will deploy a helicopter that will patrol the park. We are trying by all means to seal our borders and to put trained rangers at our key designated border posts, ports and airports. We are also having talks with international partners to stop the marketing of rhino horns,” he said. In addition to the aerial patrols, there was a costly and extensive initiative to fully fence off Etosha National Park, which has not yet been completed. Despite the best of efforts, in 2015 poaching increased to 83 rhinos, mostly in Etosha National Park. Sadly, no country is exempt from the prolific poaching of rhinos and elephants, and Namibia is indeed feeling the heat. Now only 2 months into 2016, after both aerial and foot patrols, a total of 34 rhino carcasses were discovered. 29 of them all in Etosha National Park. The carcasses are a mixture of old and new, spanning a 1 year period, according to the deputy inspector-general for operations of the Namibian police, Major General James Tjivikua. A new anti-poaching commander in Etosha was announced following this discovery, and the anti-poaching operations continue. 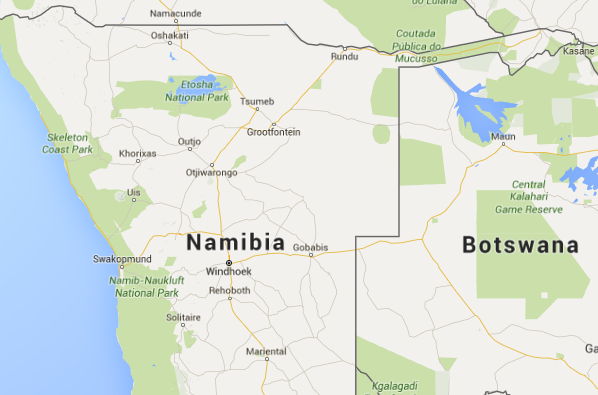 In addition, there are efforts by a private conservation trust in Namibia to raise funds to acquire flight drones in the area. 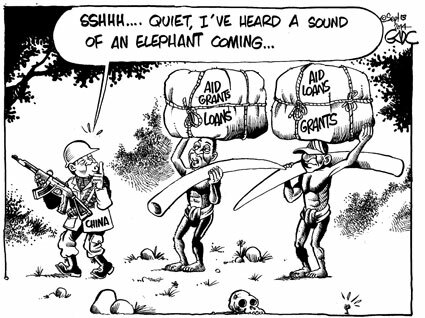 That is the dilemma for African countries with ivory stockpiles. It’s a polarizing debate. 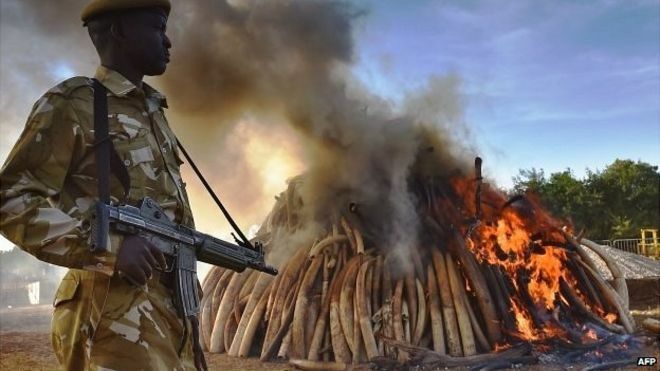 Destruction eliminates any and all possibility at corruption, it will not find its way back on the market and it sends a clear message ivory NOT attached to the animal has no value. But the other side believes saving and selling the ivory allows the money to be rolled back over into conservation efforts for the animals, and the communities. The problem is that elephants and rhinos exist throughout the African continent, making the “product” available in multiple countries, and each country has its own stance on stockpiling. So while Mozambique destroys ivory, directly across the border in Zimbabwe the country stores it, awaiting an opportunity to sell. This creates mixed messages and a lack of unity. 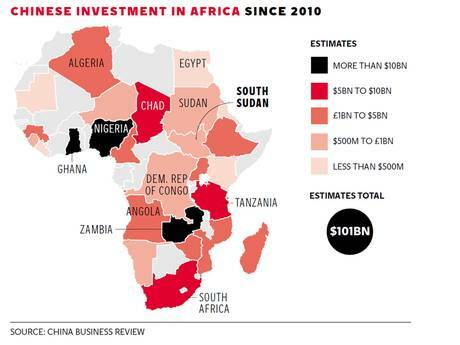 Namibia, Zimbabwe, Botswana and South Africa have a stock and sell take on ivory. Namibia Minister of Environment and Tourism Pohamba Shifeta has said destroying the ivory and horn goes against government policy. Instead the stock is auctioned off to other interested countries. “We will get a lot of money and the proceeds will go to state coffers to alleviate poverty. Also, we feel it is not an effective deterrent in fighting poaching,” said Shifeta. While Botswana states it is “out of the question” to sell rhino horn, they’ve just announced they will seek permission to sell their ivory stockpile after the 10 years moratorium with CITES has expired in 2018. Good news for the rhinos, considering the fact that Botswana is key to future rhino populations with the current translocations taking place from Kruger National Park. Not so great for elephants. Overall, an interesting proposition considering the country’s strong stance on anti-poaching, and the large stake in their wildlife. 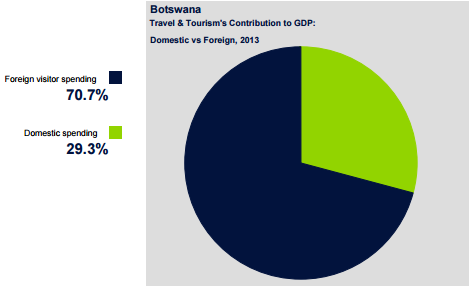 90% of tourists in Botswana come for the wildlife. 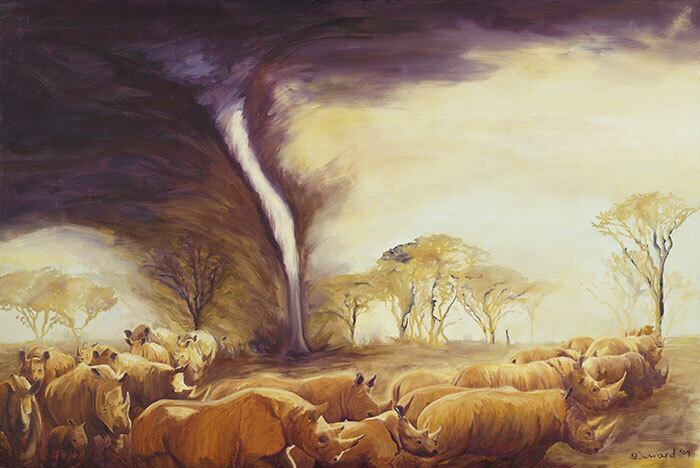 Kenya, Mozambique, Malawi and Ethiopia have all held public burns/crushes to destroy their stockpiles of horn and ivory. So the hoard and sell leads to occasional one-off sales of a set amount for a limited time. 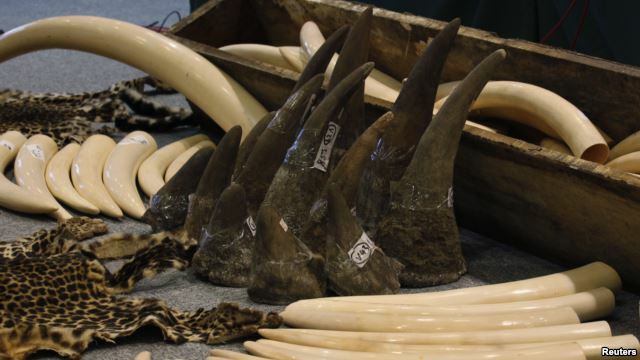 It is the belief of some that by CITES issuing these sales of horn or ivory, it fans the flames and results in a poaching spike, sending elephant and rhino populations into a tailspin. Afterall how can we allow LEGAL one-off sales of a product AND simultaneously strive at reducing demand for the same product? Confusing to say the least. The experts who work with elephants are in agreement. It is very discouraging having to fight the battle to save elephants once again. 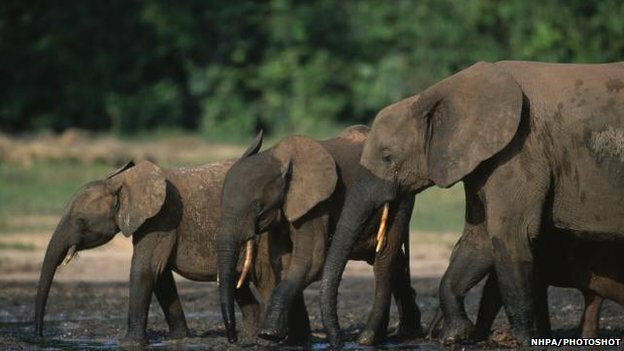 The 1989 ban helped elephants to recover in most parts of Africa. 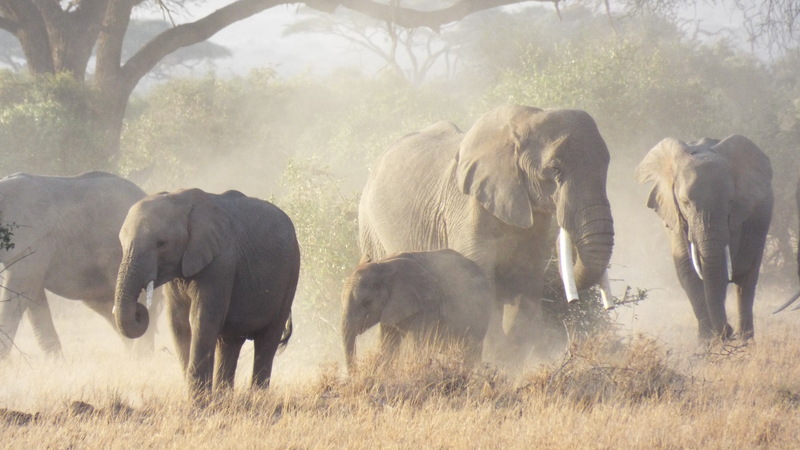 Now even in Amboseli we’re losing elephants to ivory poachers for the first time in many years. The sale of any ivory–legal or not–is creating demand. No one needs ivory. It is a beautiful substance, but the only ones who need it are elephants. As long as ivory is valued as a commodity, every tusker is at risk from poachers, and only where anti-poaching efforts are sufficient will elephants survive. Anti-poaching costs money and lives. Banning the ivory trade has been the single-most effective and economical way to slow the loss of elephants across their whole range – not just where they can be protected by anti-poaching units. So who do we listen to? 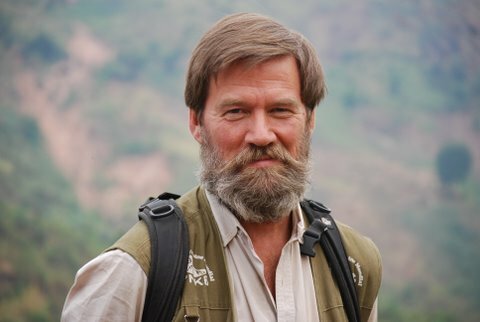 The experts who work with these creatures, seeing their lives and deaths and the daily effects of poaching? Or political officials with a mixed bag of agendas? 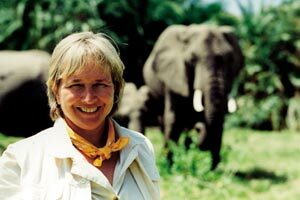 If we must view elephants, rhinos or other animal in economic terms, then we must factor in tourism. Without wildlife, there is no tourism. Period. Trade talks are going strong in South Africa. The DEA’s (Department of Environmental Affairs) specially appointed “Committee of Inquiry” is hearing both sides in an ongoing debate on a topic that is irrelevant and distracting. 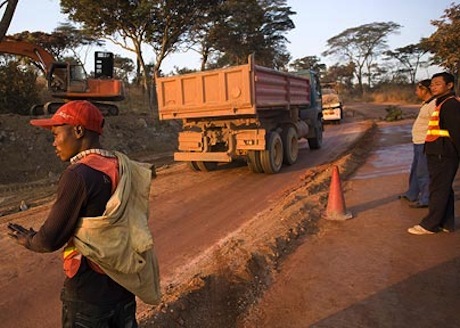 South Africa’s authorities need to understand that a trade proposal is the wrong way to go. It does not have the support of Asian rhino range states who indicated their wish to retain the trade ban in the Declaration from the First Asian Rhino Range States Meeting which took place in Indonesia on October 2013. Any proposal which might be put forward at the next CITES meeting, which will take place in South Africa in October 2016, is highly unlikely to succeed, which will be a huge public and political embarrassment for South Africa on home turf. Just in yesterday: the American trophy hunter who applied for the permit to kill the Namibian black rhino, in the name of conservation made news again. 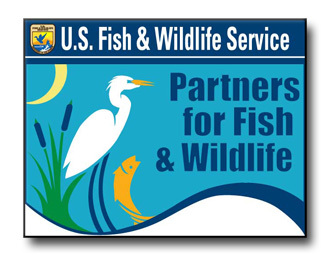 As the USFWS (United States Fish and Wildlife Service) issued permission for the hunt to go ahead. 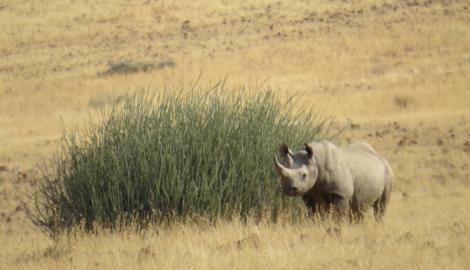 The black rhinos of Namibia are unique. 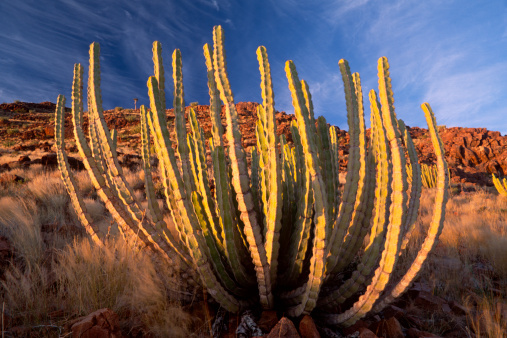 Unlike their cousins in other countries, they thrive in the harsh, dry deserts of Namibia. *They have evolved to survive without water for two to three days. *They have developed resistance to the toxic chemicals in plants native to the area. The Euphorbia plant is a favorite among Namibian rhinos, especially during droughts. *Their ranges are far greater than other black rhinos; spanning nearly 200 sq km (50,000 acres) which is twice as large as the rhinos in South Africa. A few individuals have even been reported to have ranges of over 700 sq km (173,000 acres)! 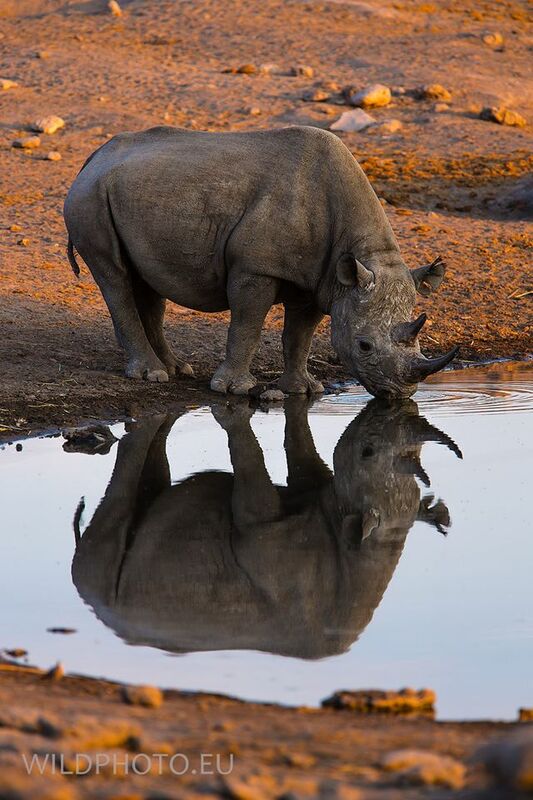 NW Namibian Black Rhino by Dave Hamman. 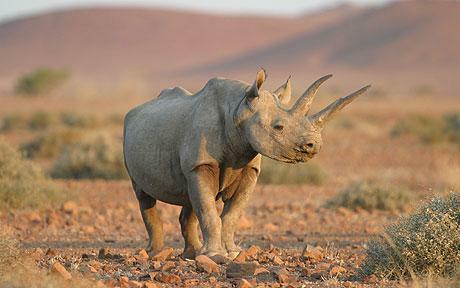 *Namibian black rhinos make up about a third of the world’s remaining rhino population. As prevalent as poaching is in Africa, for the last thirty years it was not an issue in Namibia; thanks in part to Save the Rhinos Trust. “It was essentially not an issue anymore because conservation efforts put local communities at the center,” says Jeff Muntifering, a scientific advisor at Save the Rhinos Trust. STR stepped in 30 years ago, offering poachers jobs as rangers, teaching the people how to appreciate, live with and benefit from the rhinos. 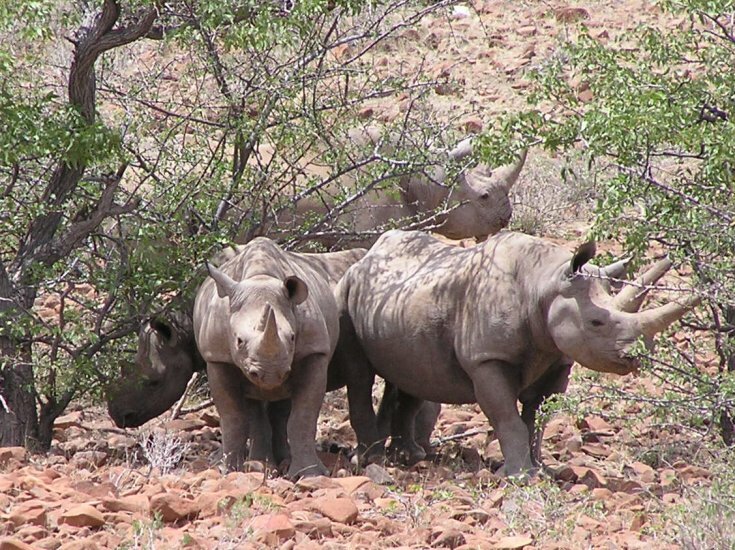 With jobs and revenues directly connected to the survival of rhino in Kunene Namibia, everyone from farmers to tourist operators, visitors and even the Namibian government share concern for rhino welfare. However, with the poaching epidemic spiraling out of control in South Africa, it is becoming problematic to other countries; including the once seemingly untouchable rhinos of Namibia. “We’ve come a long way since then (the start of the SRT program in Namibia), but organized poachers operating in our country pose the greatest threat to rhinos since Independence. After all we’ve fought for, this is unacceptable,” said Dr. Axel Hartmann, the longest-standing member of SRT’s Board of Trustees. 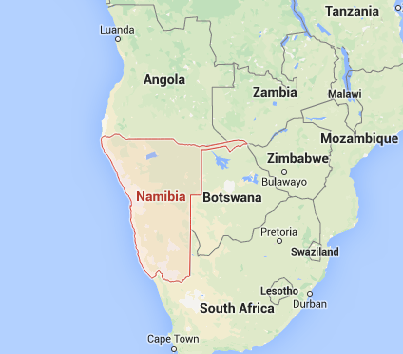 Unlike other countries, Namibia is taking a pro-active approach. It is no longer enough to track rhinos, SRT is tracking poachers. Centered in an area half a big as Kruger National Park (which is the size of Israel), with no National Park status, and in rugged desert terrain; this is no small feat. But the SRT is strengthening and re-structuring teams throughout the region to protect their rhinos. With 3 decades of community and government cooperation and a highly successful ecotourism industry, Namibia seems deeply committed and prepared to take a stand. This was a tough year for rhinos. No doubt about it. The poachings have amounted to over 1100 deaths in 2014. Outrage, grief and frustration weigh on the hearts of all of us, but there is no room for doubt or defeat. 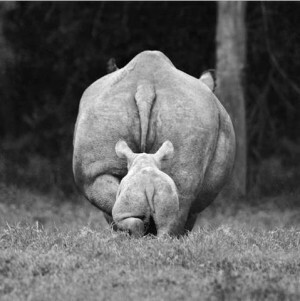 For behind the headlines of “another rhino poached”, lie seeds of hope and strength. *Awareness groups in Vietnam, like ENV (Education for Nature Vietnam), WildAct and WildAid have launched campaigns to raise awareness and change attitudes in Vietnam about rhino horn use. 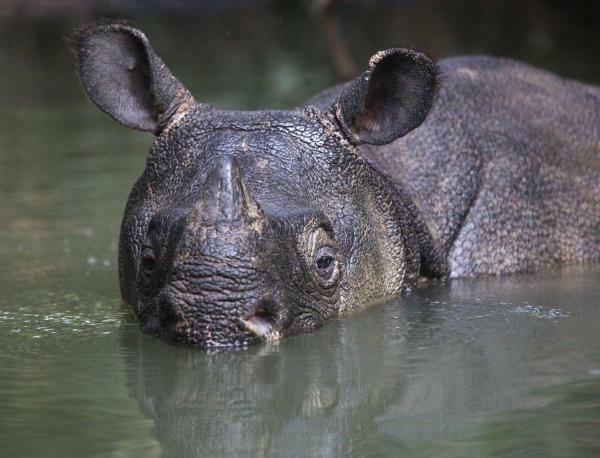 *The Javan rhino population has increased. *The US (the second largest ivory market in the world) announced a ban on commercial ivory. *Rhinos Without Borders and And Beyond have aided in the translocation of rhinos into safer, intensive protection zones. *Interpol is getting involved with seeking out the capture of rhino poachers, recognizing the importance of stopping poaching on a global, criminal level. 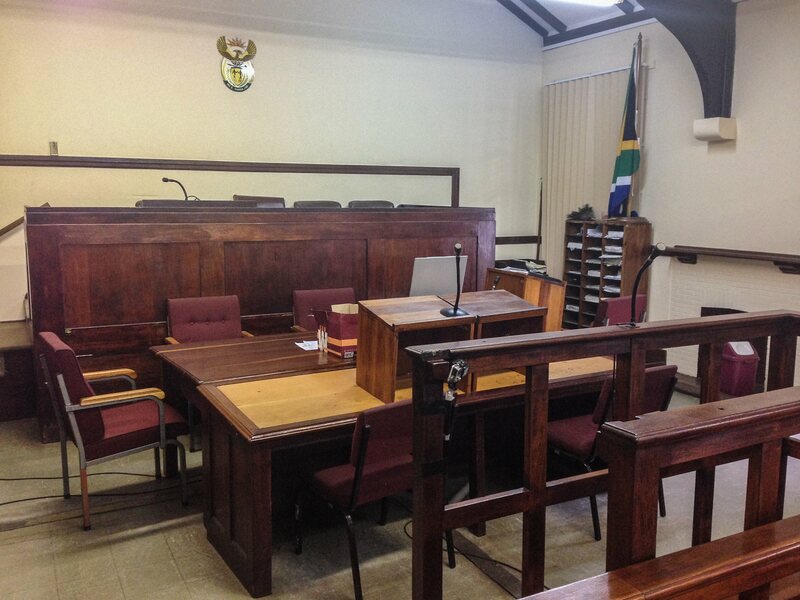 *Skukuza has increased the amount of poaching case prosecutions. *The first ever World Youth Rhino Summit was convened, educating and empowering youth throughout multiple countries to be the future leaders in conservation efforts for rhinos. *Protected areas in Sumatra have not seen any poaching incidents since 2006. *There have been multiple arrests of poaching kingpins and syndicates; from a kingpin in Tanzania to Kwazu-natal to a syndicate in Czech-Republic. *The death of Karanja, a 44-year-old black rhino with an intact horn, in the Masai Mara was of natural causes, not poaching. *Kenya claims a 50% reduction in rhino poaching. Mom and baby at Imire. 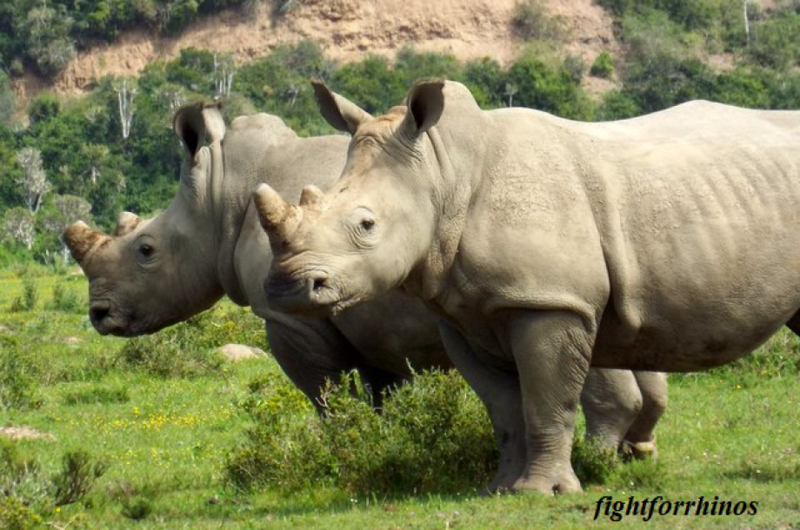 With combined efforts, Fight for Rhinos is gearing up for 2015 to be a year of change. 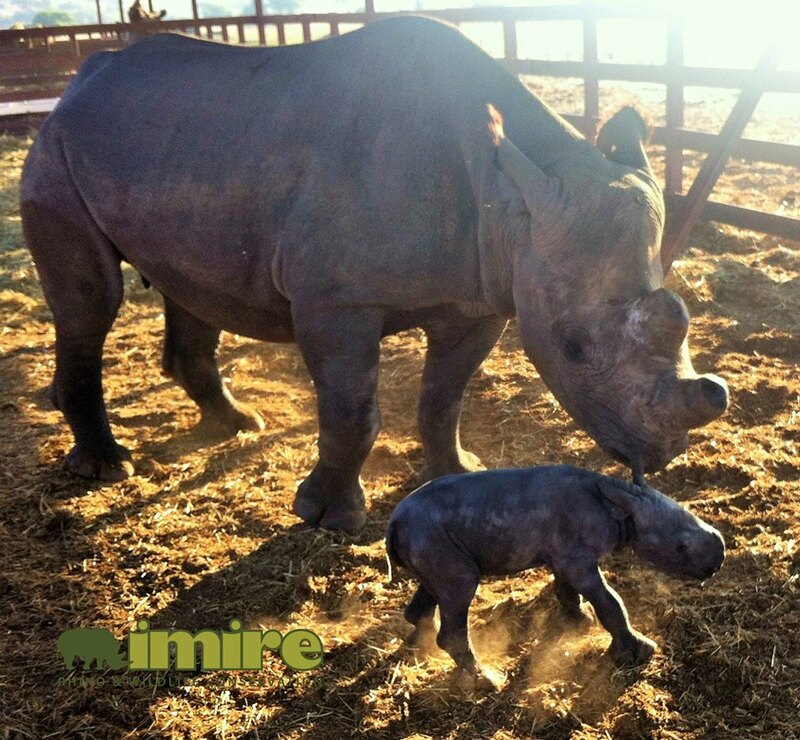 Together with Helping Rhinos, RPA, WildAct and you we can make a difference. “Endelea Kupigana” (Keep fighting)! 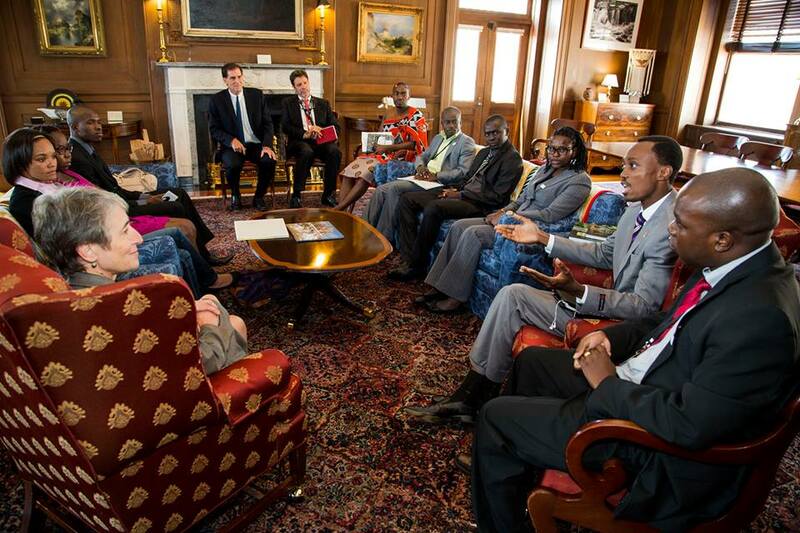 Namibia, Tanzania, Togo, and Gabon leaders meet with the US Sec of State to discuss wildlife trafficking. Washington DC: African leaders and the US Secretary of State sit in a casual setting, exchanging niceties and discussing the decimation of our world’s wildlife, mainly elephants. This week is the US African Leaders Summit, bringing together 50 African leaders and President Obama. Topics of discussion during the three-day summit include security, trade and governance. 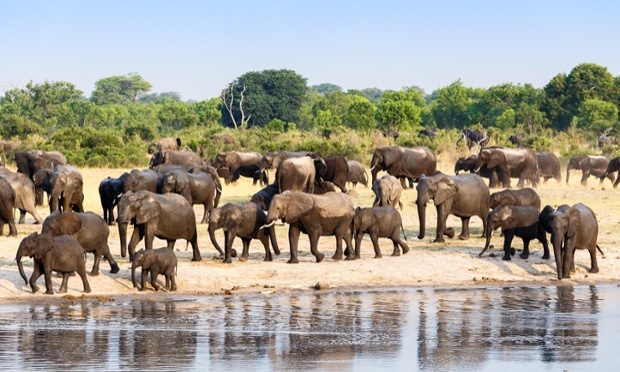 During the wildlife trafficking discussion, Tanzania’s President, Jakaya Kikwete, seemed frustrated over the lack of unity throughout neighboring countries. 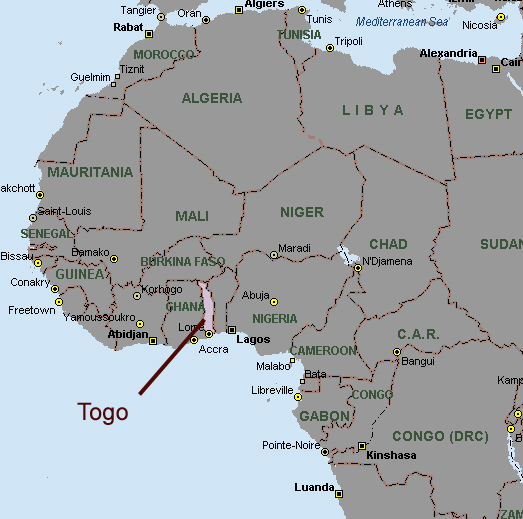 Tusks from Gabon’s forest elephants were tracked through Togo en route to Asian countries. The President of Togo, Faure Gnassingbe, expressed concern over elephant poaching, which is ironic as there are no elephants there. He stated tusks confiscated in Hong Kong and Malaysia were traced back to Togo. When asked what they would like from the US to combat poaching, the overall consensus was equipment. The ranger death toll is escalating, as they are deep in a war in which they are outmanned, outgunned and under trained. Namibia asked for helicopters, Tanzania requested night vision goggles, Togo wants infrared scanners, and Gabon-military support. Wealthy Asian businessmen , airport seizures of horn and ivory, silent apathy from politicians, ongoing heated trade debates…a ferocious circle surrounding and depleting our rhinos and elephants. Yet, at the center of it all, on the blood soaked savanna stand the rangers. The monument outside of KWS headquarters honors the fallen rangers. Under the blazing sun or in pouring rain, no weekends or holidays, for little pay and high stakes-they are the only real obstacle standing between the poachers and the rhinos. Often outgunned and outnumbered, each day is war. In Kenya hundreds of rangers have been shot in the last 3 years, and 13 killed. A recent report from the Kenyan government sited “low morale” as being a huge problem in the bush for the Kenyan Wildlife Service rangers. Leaving their families for long periods of time, not knowing if they will see them again, often met with distrust and dislike from their own communities, they face death every day. 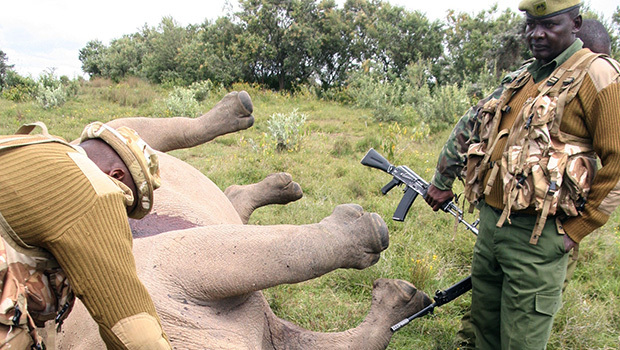 KWS rangers stand over the carcass of a poached rhino. Q: What is a typical day on patrol like for you? “Well its early up….after breakfast of only food in tins we start patrolling to see if we can’t find tracks of animals or poachers…..after we find tracks we follow…..till we get what we want. Sometimes we have to walk hours and lots of km a day to see the Rhinos or any other wildlife. We get to camp at dark and still have to make food, after that we get a few hours of sleep. Then comes night patrol. We have poachers coming at night to shoot the animals so we have to be alert at all times. We get so tired but we help each other to stay awake. Q: What determines where you patrol? And how many of you are there at a time? Q: It seems you must have a lot to take with you-the essentials for camping equip and food, weapons,etc? Q: Do you have a lot of run-ins with poachers? Q: What’s the most dangerous situation you’ve been in? Q: What’s the most rewarding situation you’ve had? Q: What do you wish you had to make your job easier, more effective? Q: How does this fit in with married life and family? Is it difficult or do you get used to it? Please help us support the rangers! We NEED them! For every 5 shirts purchased, we will send 1 to a Kenyan ranger. 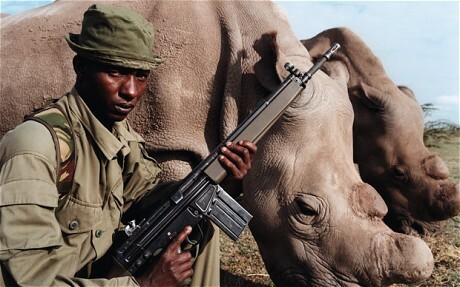 Armed ranger stands over rhinos at Ol Pejeta Consrevancy.